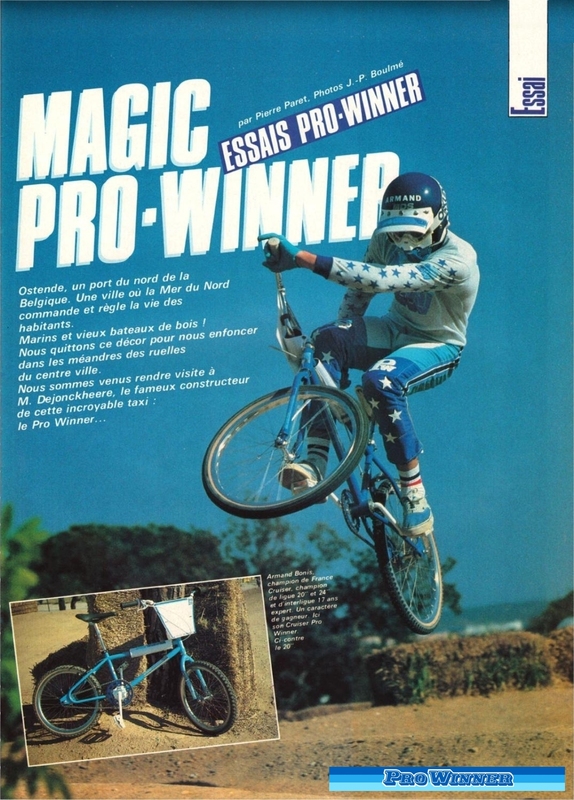 Pro Winner is a Belgian brand who started to make there own frames in 1985 by De Jonckheere. Before they bought Taiwanese frames to stick there decals on it to be sold as there own. 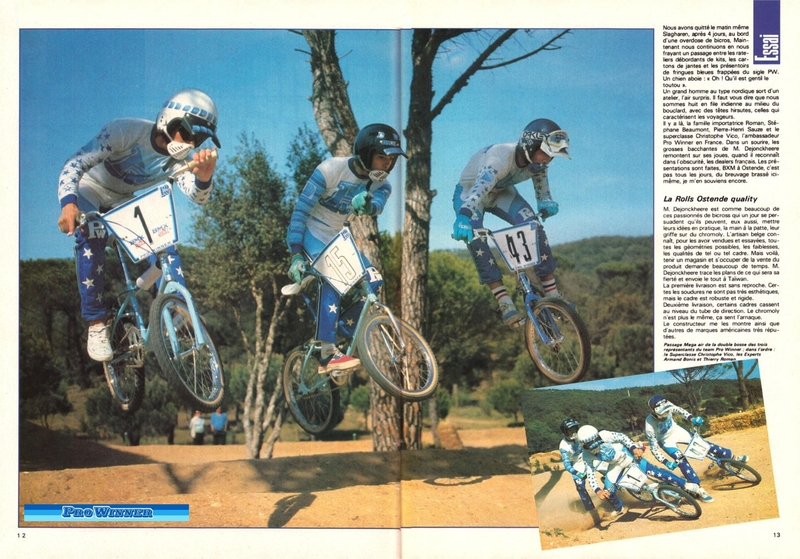 Early Pro Winner team riders used those Taiwanese frames or GT frames (as they were the importer of GT BMX). 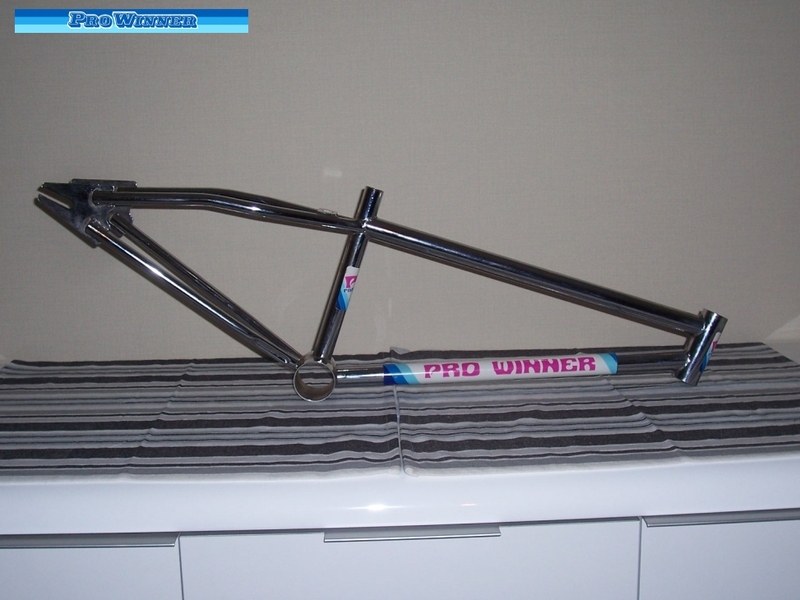 First Pro Winner frame model was a looptail and shared the same geometry as the GT's. 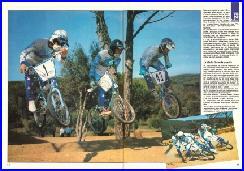 In 1988 they changed there frames to a none looptail. In 1993 a updated none looptail was introduced. In 2010 Pro Winner came with there aluminium frames.Today (2018) they still making aluminium frames. 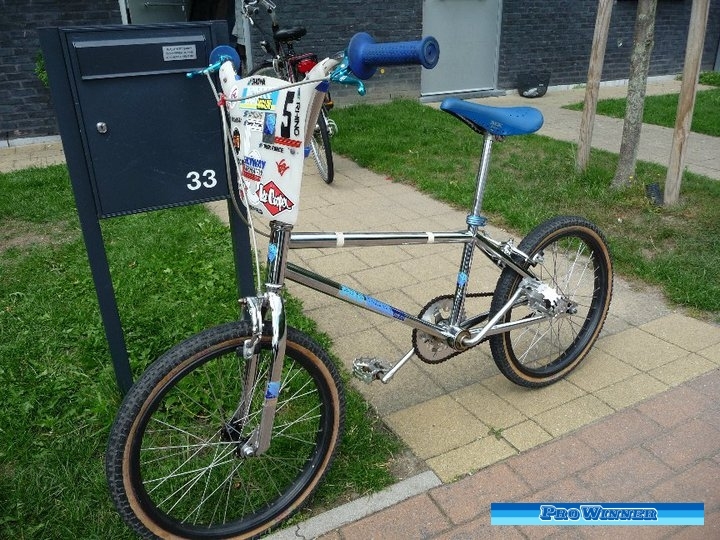 The production / sales of the frames had there ups and downs during those years and for some years they didn't make BMX frames. 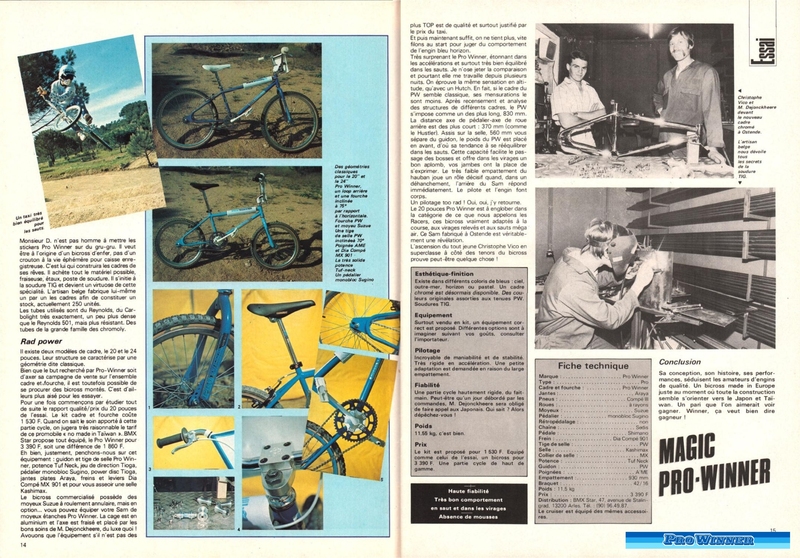 They also sold Pro Winner parts ( like seatposts, seatpost clamps, handlebars, plates, pad sets, hubs) who were mostly imported. The looptail race frames are the most known Pro Winner frames from the '80s. Pro Winner had 3 style of decals. The first ones printed on chrome foil (those were used on the first frames but also could be used on later frames). Second you have the white / blue decals with 3 colored lines in1985-86. 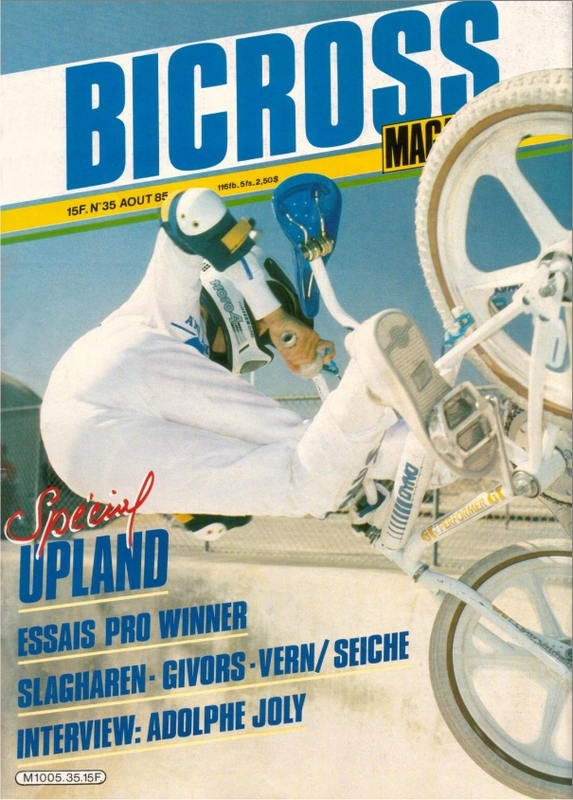 In 1987 they came with the white / pink / blue decals. There are also freestyle frames made with a looptail. The left one is the prototype with the 2nd generation decals. The right one is the updated production model (1986) with the first gen. decals cutted out. As stated before, later frames could come with the first gen. decals as seen on the freestyler. In 1988 a new design was made and didn't have the looptail. Not much is known about those frames and supose they made only a few of them. 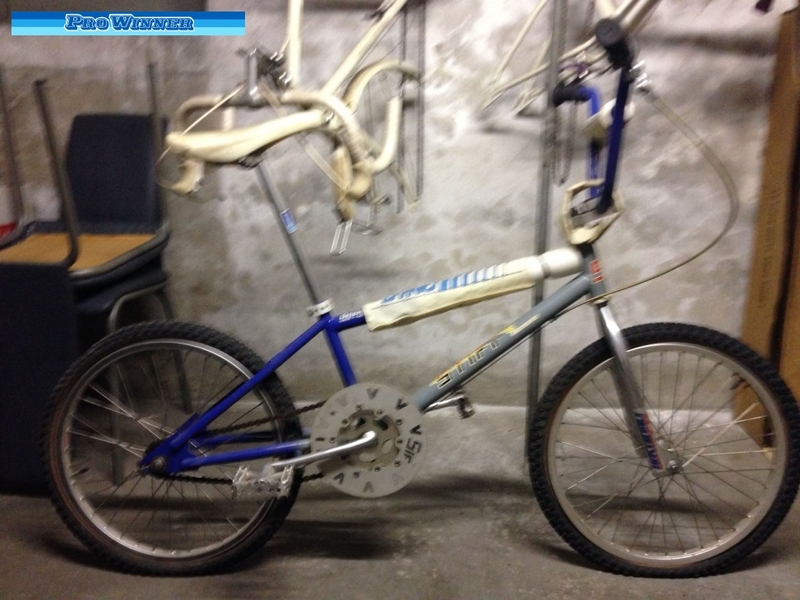 The (bad) pic on the left is a 20" pro model bike. 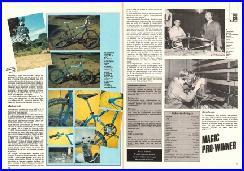 The pic on the right is a nos mini cruiser frame. 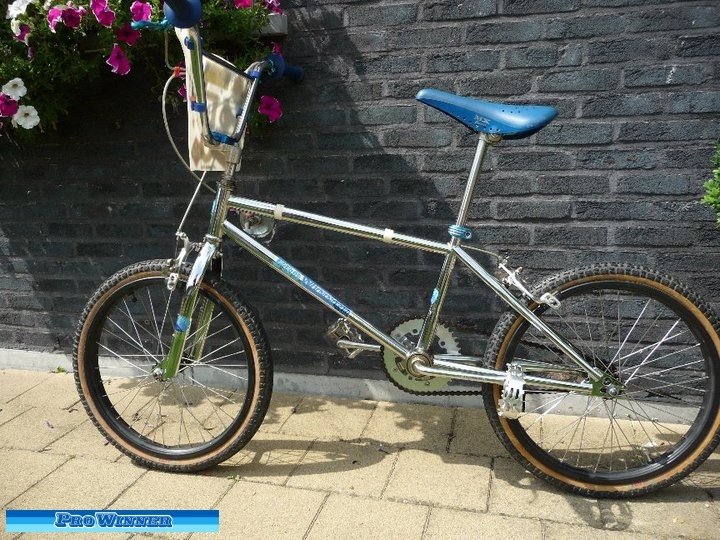 I also remember someone raced such pro cruiser bike in 1988. Those frames came with the 3rd generation decals as seen on the mini cruiser frame.